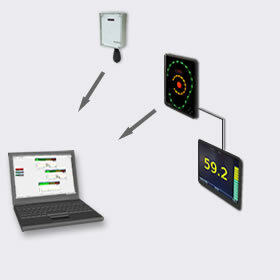 A LiveNoise system consists of a number of LiveNoise Terminals, which can be connected to your network to produce live noise reports and long term reports. The reporting can be on a computer on your network or on our web based server. Both options are included, you just choose which to use, or use both. LiveNoise Terminal: These wall mounted noise monitors just need power (adapter is included) and access to a wired or WiFi network. They can also have a display connected (not included) to show the live noise levels. Local Reporting: The Supervisor software runs on a Windows computer on your network, showing real-time noise levels and alarms. It also downloads noise measurements to the computer for generating daily, weekly, monthly or custom period noise reports. Web Based Reporting: The noise monitors upload their measurements to our LiveNoise web server, from where you can generate daily, weekly and monthly noise reports. All software and web based reporting is included when you buy one or more LiveNoise Terminals.